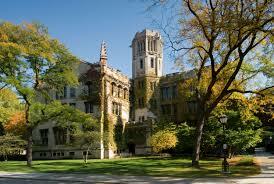 University of Chicago, via Wikipedia. The University of Chicago shut down today after the FBI warned of an online threat of gun violence on campus, The Chicago Sun-Times reports. The Hyde Park campus “will have an increased police and security presence on and around campus, including police personnel with visible weapons and other additional measures,” University of Chicago President Robert J. Zimmer wrote. The FBI said someone posted an online threat of gun violence against the school for 10 a.m. Monday. Posted: 11/30/15 at 9:14 AM under News Story.